ODCCA in Partnership with Ward World Carving Championship! We're going to the World! Hey kids - get started now! Entries from children participating in the March 10, 11, 2018 ODCCA Youth Silhouette Contest will be eligible to compete in the prestigious 2018 Ward World Carving Championship, April 27-29, 2018 in Ocean City, Maryland. ODCCA will assist in the delivery of all winning entries to the Ward Show. The concept of the silhouette competition is simple and yet challenging. The RED KNOT has been selected as the 2018 competition bird. ​12 – 15; 11 and under. 1. 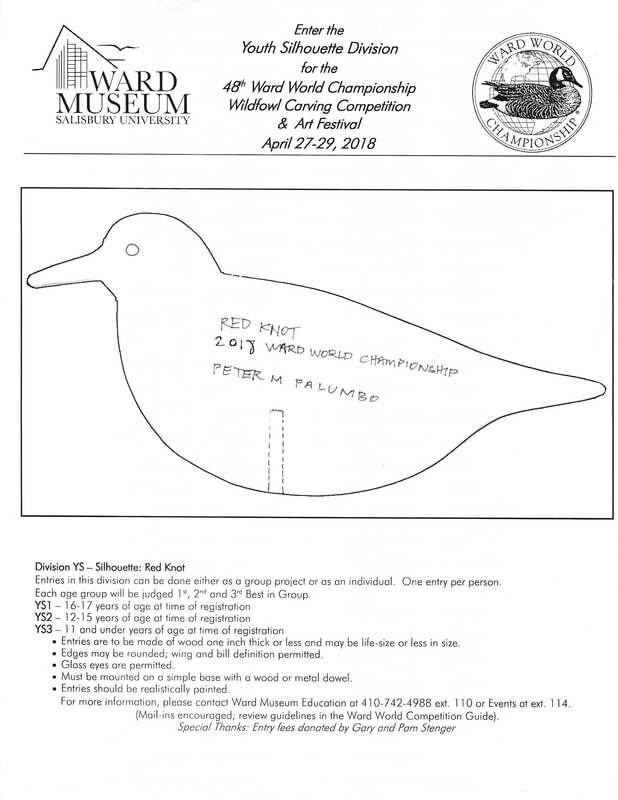 This year's Red Knot pattern and rules will be available on the Ward Museum website at: www.wardmuseum.org. Other patterns may be used. 2. Entries are to be made of wood, one inch thick or less and may be life-size or less in size. 3. Edges may be rounded; wing and bill definition permitted. 4. Glass eyes are permitted. 5. Must be mounted on a simple base with a wood or metal dowel. 6. Entries should be realistically painted.